Bloom is a fast, light-weight, cross-platform procedural graphics editor that lets you tweak any action you have ever performed - organized by layer. Beautifying images is a somewhat common practice, but you need to have the right tools at hand if you want to optimize your work. Bloom is an OS X image processor that works with multiple layers in order to provide non-destructive processing solutions. This way, you can make use of the plethora of available tools while knowing that you can adjust their effect later on without having to redo the entire process. 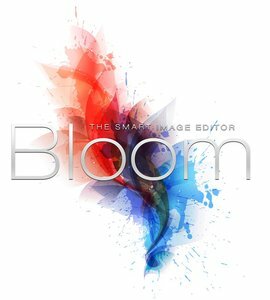 - Bloom seamlessly integrates both vector and raster editing, automatically converting between the two as necessary. This not only makes it extremely versatile and suitable for any taks from interface design to photo retouching, but also lets you apply purely raster effects and filters to vector shapes without losing any vector data. - Bloom is the first editor to allow true non-destructive editing. Every filter, effect, brush stroke or vector edit you apply is stored separately, and nothing is baked in. This allows you to come back to anything you've done in the past and adjust it - without redoing all of the subsequent work. Even brush strokes are editable after you've drawn them! - Bloom is a purely 16-bit per channel application. Everything, including images, shape colors, masks, and any other color data is stored with 16 bits per channel. This means you never lose precision and color accuracy, allowing for the most vibrant and precise images to be created. - Unlike many other apps that claim to import Adobe Photoshop PSD file, yet import minimal information, Bloom imports practically everything. Not only does Bloom's PSD importer support layers and groups, it also imports masks on both of them, layer blending modes, and even layer blending effects - on both layers and groups! - Bloom features a full suite of blending effects, including drop shadows, inner and outer glows, stroking, inner shadows, and bevelling. These versatile effects allow you to easily edit layer shapes without changing layer style, as well as help with compatibility with other applications. - Bloom features excellent digital tablet support, recoginizing the drawing vs. the eraser tip of the brush, pen pressure, and scene scrolling with the digital pen alone. Brush settings also support ability to control aspects such as opacity, size, and any other setting with pen pressure - all customizable by you. Below you can post Comment about Free download Bloom.1.0.466 Mac OS X, full download Bloom.1.0.466 Mac OS X free from rapidshare, filesonic, fileserve, megaupload, mediafire, hotfile, ftp, direct download. Bloom.1.0.466 Mac OS X Torrent Download or anything related to the article here. Only English is allowed.